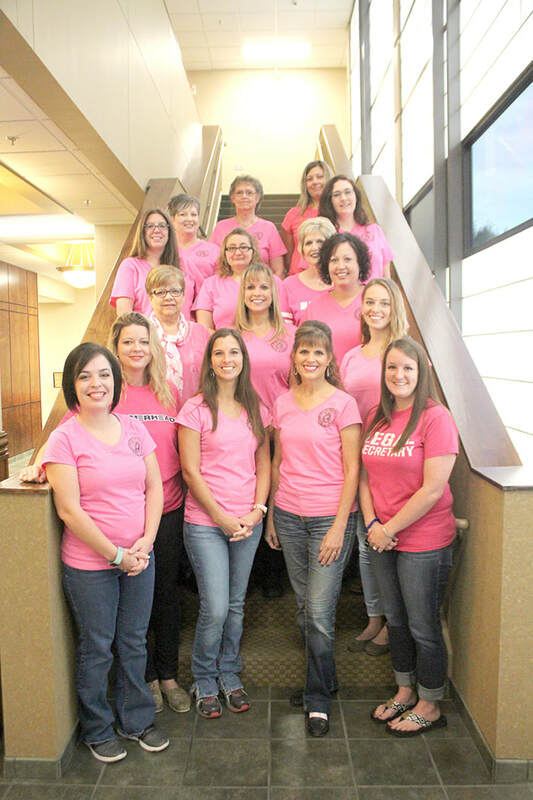 Each year, the Barry County Judicial Center has a pink out day where employees wear pink for breast cancer awareness and to raise money for cancer patients in Barry County. Other fundraisers, including the pumpkin carving contest and dress down days for employees all contribute to the funds raised. The employees from the Circuit Clerk’s office and the Prosecuting Attorney’s office participated are pictured above. In the front row, from left to right: Kami Renkoski, Alicia McManus, Terra Stockton, Marty Stearns and Kasey Hendrix. Second row: Deb Miller Kristina Hayes and Katie Epling. Third row: Shannon Pyle, Katie Correia, Chris Willyard and Rosanna Miller. Back row: Sherry Allee, Reta Voelker, Michelle Heimerman and Carly Morrison.